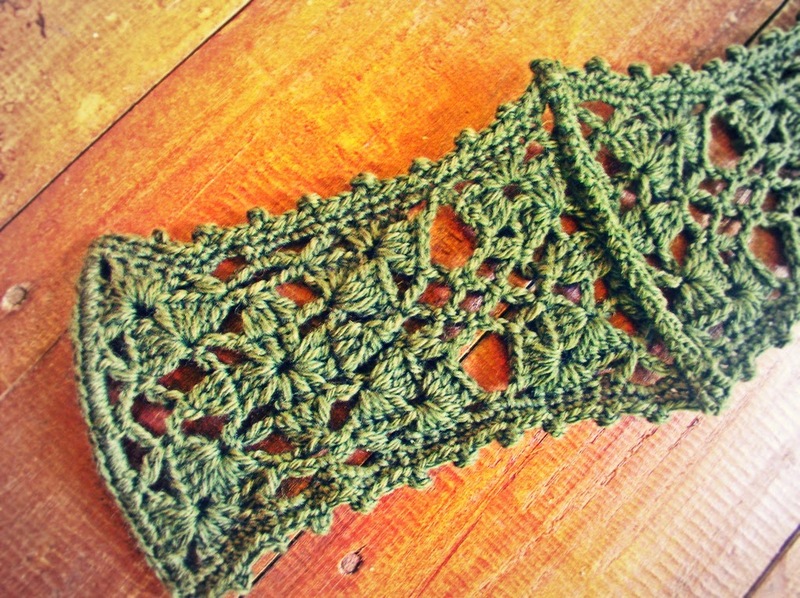 Yesterday, I started working on a revision of the Square Motif Belt with Pineapple Fringes. I used worsted weight yarn and a 3.5mm crochet hook. Originally, I used two strands of cotton thread size 8. This time, I was determined to make a bulkier belt, with no fringes, and styled like a corset. I finished work on the belt this afternoon and am very happy with the result. I started by crocheting the motifs and joined them together to make a strip. The strip is 5 motifs long, just shorter than my size which is good because the belt will stretch and I want this to have ties in the front. 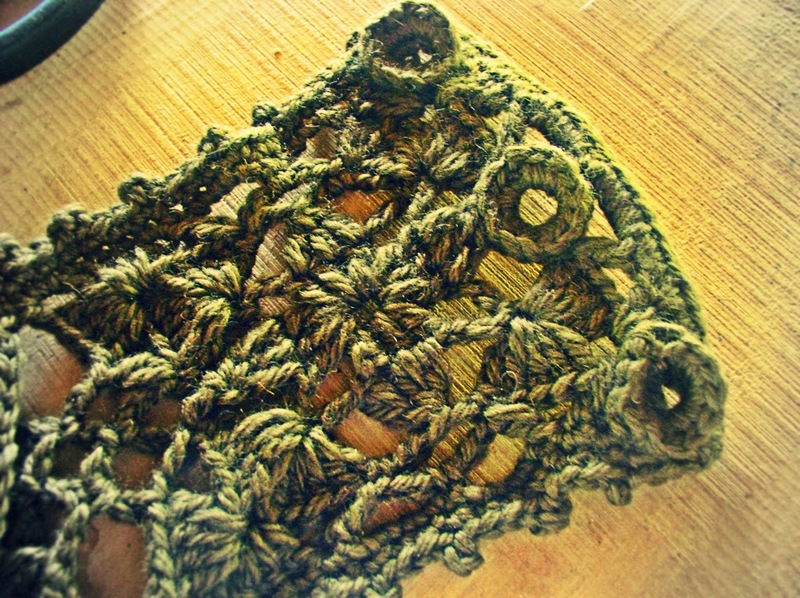 Then I crocheted a round of sc’s all around the belt. 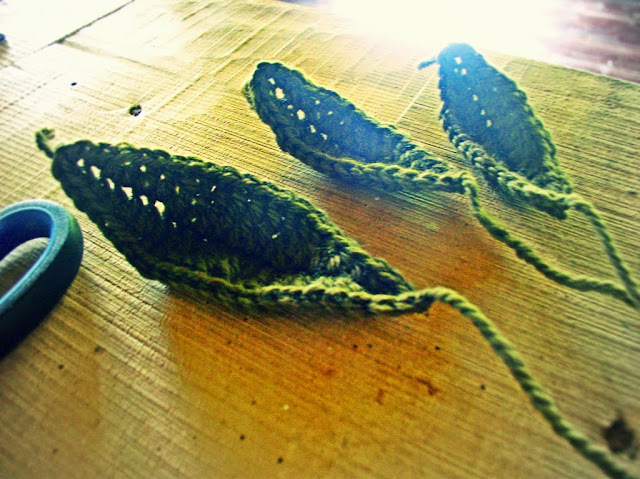 I made a second round of [3sc’s, picot] along the sides of the belt but not along the ends of the belt. The ends of the belt, I reinforced with some plastic corset bones. I did this be holding the plastic bones next to the sc’s and made sc’s around it. 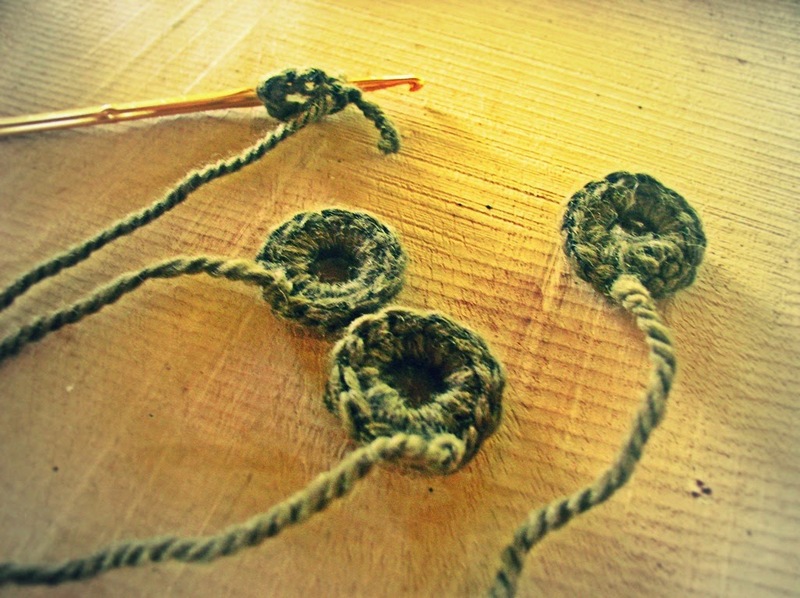 I also had to sew the ends of the sc rounds in order to keep the plastic bones in place. Looking at the belt with the bones at the ends, I decided to add vertically next to the sides of the waist. 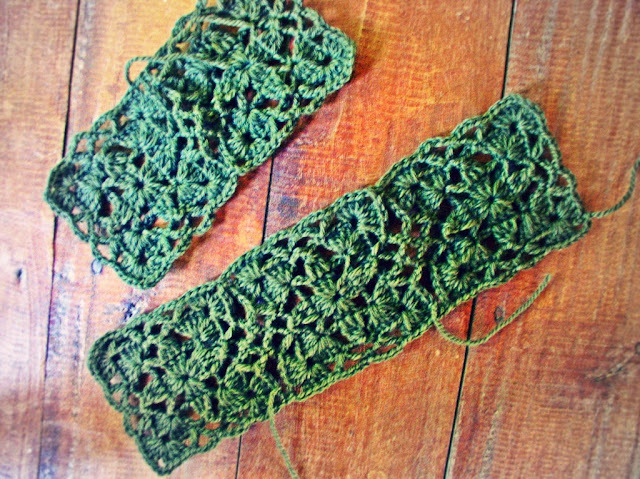 I did this by first crocheting a narrow strip (ch 3, sc in 2nd ch fr hook, sc in next ch, ch 1, turn, sc in each of 2 sc, ch 1, turn …) and leaving a long tail for sewing. I used this tail to sew the strip over the plastic bones. Two of these went to the two sides of the belt and prevented the belt from narrowing as the belt is pulled taut. Next are the rings for the belt ties. The rings are made as such: ch 5, sl st in 5th ch fr hook to form ring, ch 1, 12 sc in ring, sl st in first sc to join, ch 1, 12 sc over the first round of sc’s, sl st in first sc to join. Fasten off. I made six of these rings, fastening off with long tails for sewing onto the belt. Then I sewed the rings onto the ends of the belt, leaving the outer half of the rings un-sewn as this is where the ties will pass through. Ch 17, sc in 2nd ch fr hook, sc in next ch, hdc in next 2 ch, dc in next 8 ch, hdc in next 2 ch, sc in last 2 ch, ch 1, now working along free loops along other side of foundation ch, make sc in next 2 ch, hdc in next 2 ch, dc in next 8 ch, hdc in next 2 ch and sc in last 2 ch. Ch 1 and sl st in ch at tip of leaf to join. Fasten off with long tail for sewing. Ch 21, sc in 2nd ch fr hook, sc in next ch, hdc in next 2 ch, dc in next 2 ch, tr in next 8 ch, dc in next 2 ch, hdc in next 2 ch, sc in last 2 ch, ch 1, now working along free loops of other side of foundation ch, make sc in next 2 ch, hdc in next 2 ch, dc in next 2 ch, tr in next 8 ch, dc in next 2 ch, hdc in next 2 ch, sc in last 2 ch, ch 1, sl st in ch at tip of leaf to join. Fasten off with long tail for sewing. 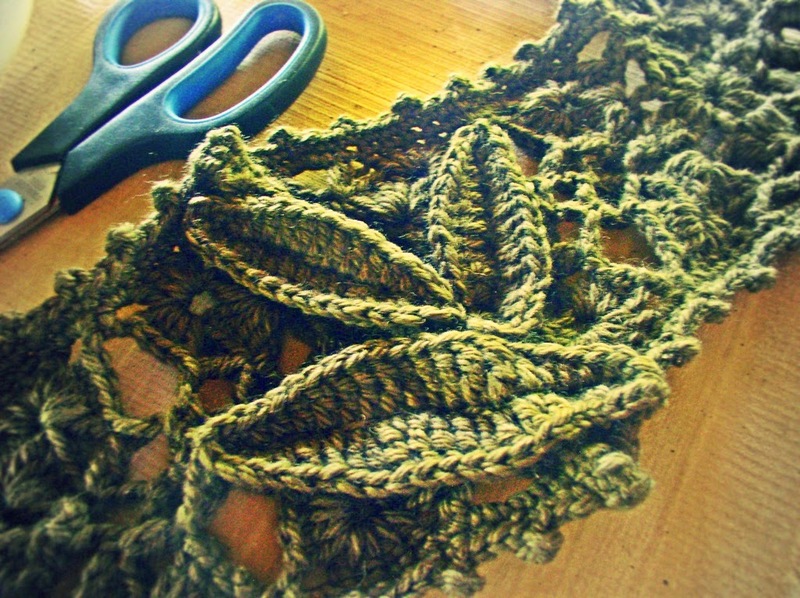 I arranged the leaves over the bones of the belt and sewed them in place. I sewed only along the midrib of the leaves. 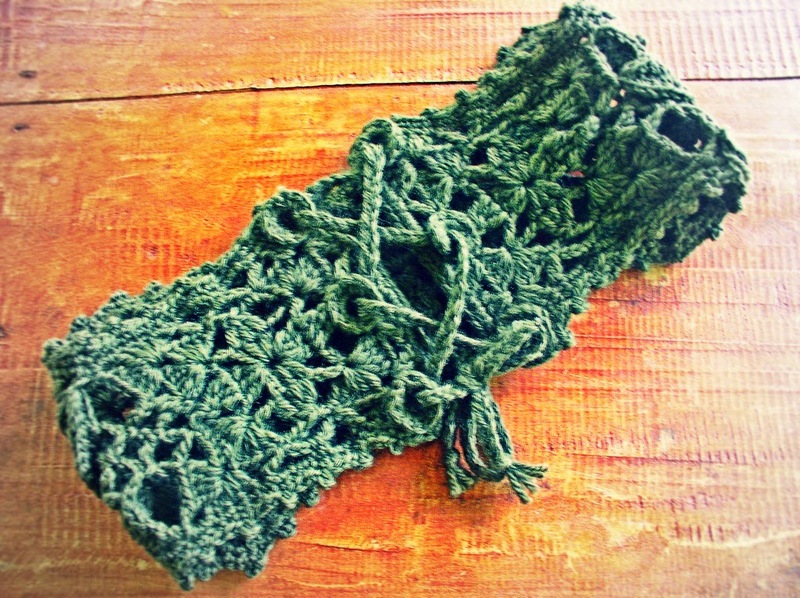 And finally, I took six strands of yarn to make a braid about 24 inches long. I used this braid as ties for the belt, criss- crossing over the front as shown below, the finished belt. 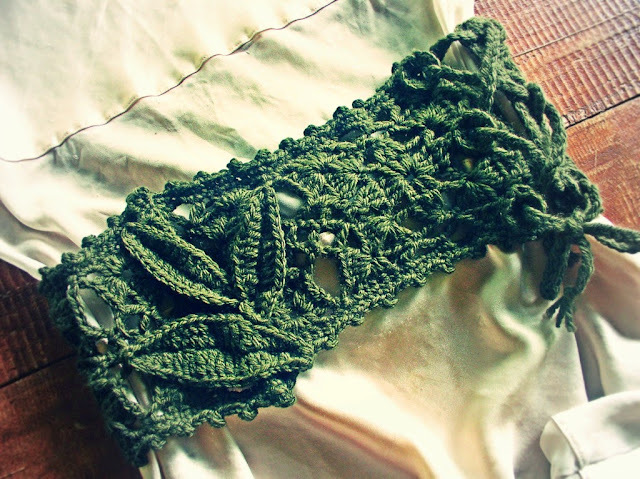 Here (above) is a view of one side of the belt, showing the leaves over the bones. And here (below) is the back view of the belt. 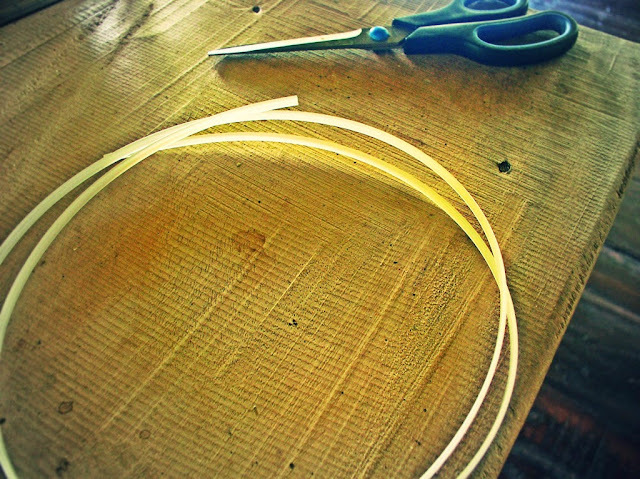 The finished belt measures approximately 5.5 inches wide along the bones. 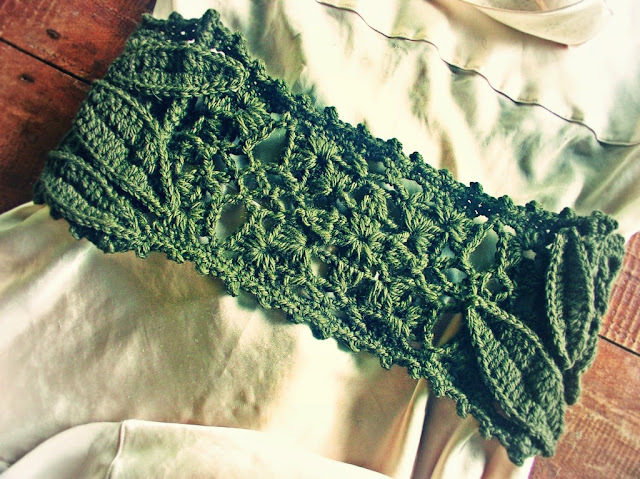 This Corset-Style Motif Belt is relatively easy to make, and the motifs work up quickly with worsted weight yarn. The hardest part in making the belt was crocheting over the plastic bones. Below are the instructions for the motifs. If you make your own version of this belt, please let me know! Ch 5, sl st in fifth ch fr hook to make ring. Rnd 1: Ch 3, 2 dc in ring, *ch 5, 3 dc in ring, rep from * twice more, ch 2, tr in top of ch-3. Rnd 2: *Ch 5, with one loop of each remaining in hook dc in next 3 dc, yo, and pull through all loops on hook (3-dc- cluster made), ch 5, sc in 5-ch loop, rep from * 3 more times ending last rep with ch-5 and sl st in base of first ch-5. Rnd 3: Ch 3 (count as 1 dc), 3 dc in same st, *sc in next 5-ch loop, ch 5, sc in next 5-ch loop, 4 dc in next sc, ch 3, 4 dc in same sc, rep from * 2 more times, sc in next 5-ch loop, ch 5, sc in next 5-ch loop, 4 dc in next sc, ch 1, dc in top of ch-3. Rnd 4: Ch 3, 3 dc in same sp, *sk 4 dc, dc in sc, ch 4, sc in 5-ch loop, ch 4, dc in next sc, sk 4 dc, 4 dc in 3-ch loop, ch 3, 4 dc in same loop, rep from * 2 more times, sk 4 dc, dc in sc, ch 4, sc in 5-ch loop, ch 4, dc in next sc, sk 4 dc, 4 dc in 3-ch loop, ch 3, sl st in top of first ch-3 to join. Fasten off. Rnds 1-3: Same as motif above. Rnd 4: (Joining) Ch 3, 3 dc in same sp, sk 4 dc, dc in sc, ch 2, with wrong sides facing each other sc in first 4-ch loop of previous motif, ch 2, sc in ch-5 loop of current motif, ch 2, sc in next 4-ch loop of previous motif, ch 2, dc in sc of current motif, sk 4 dc, 4 dc in 3-ch loop, ch 1, sc in ch-3 loop of previous motif, ch 1, 4 dc in same loop of current motif, sk 4 dc, *dc in sc, ch 4, sc in 5-ch loop, ch 4, dc in next sc, sk 4 dc, 4 dc in next 3-ch loop, ch 3, 4 dc in same loop, rep from * ; dc in sc, ch 4, sc in 5-ch loop, ch 4, dc in next sc, sk 4 dc, 4 dc in next 3-ch loop, ch 1, sc in ch-3 loop of previous motif, ch 1, sl st in top of first ch-3 of current motif to join. Fasten off. Join more motifs in the same manner until you reach desired length.